Join a joystick to your XBee radio for a terrific way to add movement to your projects, sending anything you like in different directions. You can achieve full wireless control of household robots, industrial equipment, safety cameras…even stratosphere-seeking weather balloons. Set about inventing a new class of cat toys or create a new way to interact with museum exhibits. Maybe you’d like to make an interactive lawn sprinkler that waters your name in the grass? Here’s a terrific way to control it! 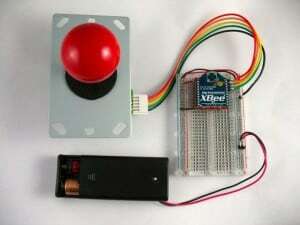 This tutorial walks you through the easy way to connect an Adafruit Small Arcade Joystick to your XBee. The video below shows the joystick connected to a group of four wireless LEDs. You might want to try controlling stepper motors to create directional movement, orchestrating water pumps into a casino-style fountain or harvesting crops from the comfort of your porch swing. Start building one today!